Rachel and Matt’s Star Wars themed Wedding Has Been Published! Congratulations to Rachel and Matt on their marriage! This beautiful couple tied the knot on June 7, 2015 at the Grand Summit Hotel in Summit, NJ. Their wedding was recently published by the Wall Street Journal! The Wall Street Journal is the got-to place for current news and interesting, trending stories! A highly praised publication, this is your online destination for fun stories or fresh information! 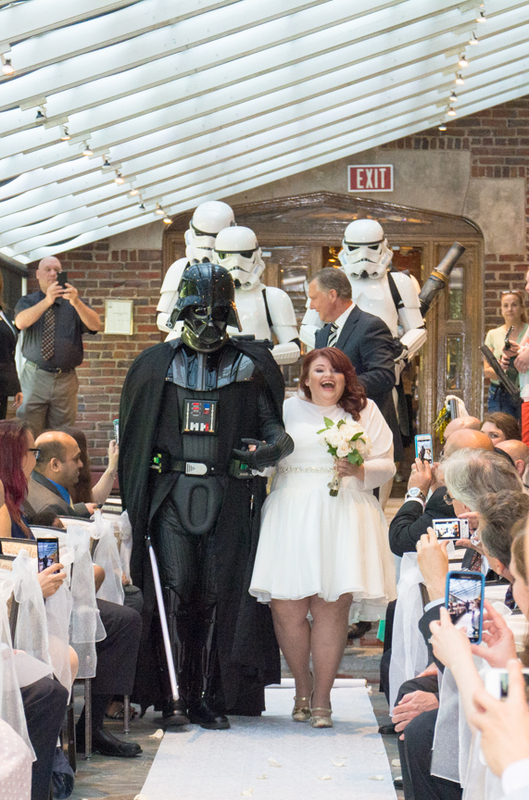 The force was strong between these two as the made their way to the alter accompanied by Star Wars characters. Their published photo captured their love, excitement, and ultimate dream come true as they started their new life and began their chapter for a long long time! Our NJ Wedding Photographer captured everything from the cake to the costumes that made this night so unique! Simply put, this wedding was unforgettable!